Assuredly it was a terrible, lamentable tragedy. But it seems to me that we should be a mature enough people to view it not in terms of the easy, conventional stereotypes of good guys and bad guys but in terms, rather, of decent, ordinary people caught up in the passions and insanities of an armed conflict that none of them intended or anticipated. 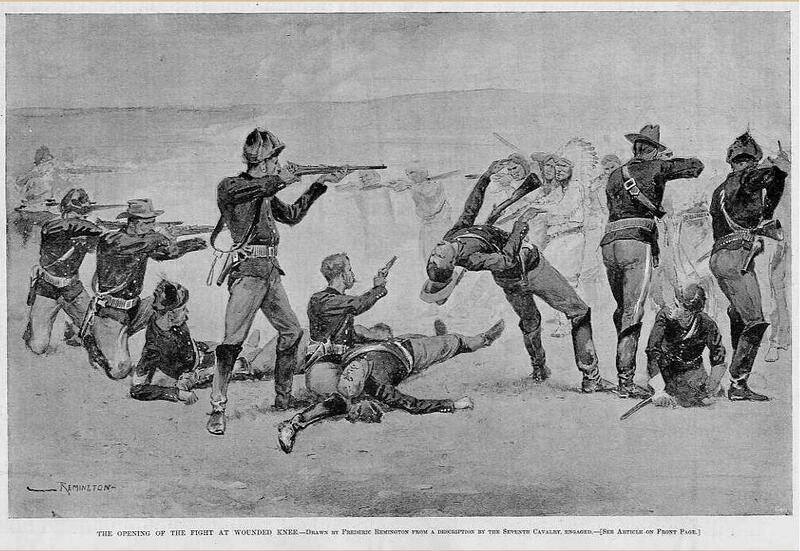 Frederic Remington’s “The Opening of the Fight at Wounded Knee,” originally published in Harper’s Weekly, 24 Jan 1891. Sam Russell There is noooo shortage of web postings of the Lakota view point on Wounded Knee. It dominates the discussion on the internet. Lost to the literary conversation about the battle since Robet Utley published his landmark work over 50 years ago are the primary source documents from the Army… thus the reason for my blog. Chris: but still with all the testimonies and interviews and studies made on this massacre,the U.S still refuse to rescind the 20 some medals of honor awarded that day for gallantry in battle.Is this a joke or …..
Sam Russell As with all historical events, they are evaluated and judged by the perspectives of the various participants. Of course the Army officially views Wounded Knee from the Army perspective. Just as they view Afghanistan from the Army perspective, and Iraq from the Army perspective, and Vietnam from the Army perspective. It would be absurd to ask the US Government to evaluate our medal of honor recipients from Iraq from the viewpoint of Al Qaeda. I hope for the sake of today’s soldiers that our descendants 125 years from now don’t demand that medals for valor and gallantry in Afghanistan be rescinded because they only view that war from a Taliban perspective. In the 1890s the US Government believed those soldiers merited recognition for their actions. To understand why they were awarded, you have to study the Army’s perspective. Billy: No Chris, there are two sides to every story. The Indian side has been posted often, however as Sam pointed out, the Army side has not. What his research shows is that no matter what happened after the firing started, i.e., purported or actual massacre, that previous to that there were Lakota warriors armed and ready to fight; thus you have two keyed-up armed forces facing each other and only needing someone to drop a match into the tinderbox. Billy: Chris, I understand and respect your opinion but we, even as amateur historians, have to be able to dispassionately view both sides in order to form some non-biased opinion. Were passions inflamed? Undoubtedly. Were some of the stories passed on by survivors exaggerated? Very likely. Oral histories while often accurately hitting the high-points of an event do fail when it comes to the details. Sam Russell Chris, regarding whether Wounded Knee is better labeled as a massacre vice battle, following is an excerpt from my masters thesis I wrote at Fort Leavenworth in 2001 that addresses that contentious issue. (If someone asked me what one book they should read to gain a balanced understanding of what happened at Wounded Knee, it would be Robert Utley’s Last Days of the Sioux Nation). In the most recent Congressional hearings on Wounded Knee, Senator James Abourezk, Chairman of the Senate Judiciary Committee, introduced legislation in February 1976 “to award compensation to descendants of survivors of the Army’s massacre of Sioux Indians at Wounded Knee Creek” calling for “$3,000 to be paid to descendants.” This was the third time such legislation had been proposed, and the third time it had been defeated. The hearings produced almost 600 pages of invaluable testimony from expert historians such as Robert M. Utley, Dee A. Brown, and Rex A. Smith. At one point the hearings went to great pains in defining “massacre” and “battle” in attempts to properly describe the events at Wounded Knee by introducing definitions from numerous dictionaries. One definition read “the indiscriminate, merciless killing of human beings….” Dr. Utley, whose 1963 landmark work, The Last Days of the Sioux Nation, more than qualified him as an expert historian, provided testimony that perhaps went the furthest in putting Wounded Knee into a proper context. “I am fully aware that contemporary evidence can be extracted from the vast body of original sources to support almost any interpretation one wishes to place on Wounded Knee or any other controversial historical event, for that matter. Sound history, however, is careful synthesis of all the evidence, in which corroboration of individual testimony is sought and the possible and the probable and the credible carefully weighed. Studied as a whole, rather than in isolated bits and pieces, the historical evidence, from both white and Indian sources, does not substantiate Wounded Knee as a massacre in terms of premeditation or lack of discrimination between combatants and noncombatants. Layton: Obviously, a very controversial topic. We have those topics on this page. As administrator, I want to thank Sam, Chris, and Billy, for discussing this topic, in a civilized and adult manner. It is much appreciated. Frank: Maybe I should start another thread, but I always find it interesting as to how some folks label one fight as a massacre and one as a battle. Depends all on your perspective. John: Bob Utley told me last year at a conference he wishes he could revise and re-write “Last Days of the Sioux Nation” is it is very much out of date in light of new research material, including the title. Obviously, the Sioux Nation is alive and well today and the population increasing. Sam Russell Every historian’s regret is the amount of material they find AFTER they’ve published. John: The little details are usually not as significant as the bigger overall picture, Billy. I’m no expert on Wounded Knee, but Jerry Greene is (from both perspectives). If we want to see both sides with scholarly interpretation and conclusions based on the weight of evidence from a professional historian, please wait until March, for the release of Greene’s most comprehensive tome, “American Carnage, Wounded Knee, 1890.” It will be accepted as the definitive study, I’m certain and not just a never ending list of anecdotal facts and details in search of a thesis. Billy: Sometimes the little details add up John. However, on your overall point, I’m not going to disagree too much. Insofar as Jerry’s book, I’ve already reserved the funds to buy it. As far as I know, no one disputes his impartiality. Of course, WK may be a first depending upon whose deeply held believes he steps upon. Chris: Well, i might not be totally objective on this subject as my kids are all descendants from wounded knee survivors and i had the privilege to know and visit with old people whose folks where in this massacre,but when u hear ,or read reports of soldiers finding women and children trying to hide and they shot them without any hesitation,i do not know what definition u give to this type of action,it was not a case of misidentification.So one can alway go by this historian or that one writting,it doesnt change the fact of what happened there and what t was. Al: Oh, it is not your ad hominem. All hell broke out with a shot. Ron: Surely the events that occurred at Wounded Knee were tragic but the fact is that, by human nature, emotion clouds objectivity. We can dispute this on and on about the wrongs of the soldiers’ actions and the slaughter of innocent women and children because our emotions about the situation drive us to those places in our minds. Chris, let’s also then talk about all the women and children of other tribes that the Lakota slaughtered just as you are so consistently pointing out that your children are descendants from Wounded Knee survivors. Perhaps they are also descendants of those who had killed other tribes’ women and children. I am not trying to be rude or nasty but the point I am trying to make is why should anyone of us be afraid to discuss this, have differing views, or apologize for something that we were not alive to influence positively or negatively. No one on this group would say they want to forget the past but we shouldn’t continue to suffer from things we had no control over. Maybe it is time to delve into what happened, try to learn from it, and respect that there are and always will be varying views of what happened, the hows and whys of what happened and how we can learn from it to change our lives moving forward. Sam Russell Chris, the key to your position is that you’ve opted to believe “facts” as presented by one side, and I certainly understand why. I fully recognize my bias being a descendant of a cavalry officer at the battle. That soldiers positively identified women and children hidden in the Ravine and then knowingly murdered them, I would posit is dependent on whose “facts” you care to believe. Most every soldier account I’ve read disputes what you state is fact. That soldiers killed women and children is not in dispute; that they did so wantonly and mercilessly, requires one to discount cavalry first hand accounts for Lakota first hand accounts. As Utley pointed out, there are ample primary sources to support either side. Chris: well why would they acknowledge those actions,by the same token ,sand creek was a battle and all the other massacre,milk river,blue water,ect….and all the women and children were just killed by mistakes,if those are the facts from the military,so be it,i am not looking for an apology ,but lets call things what they are,yes the plains warriors were as Al is desrcibing and they followed their rules of war ,an enemy was an enemy,man women or child,were those the same rules of war the U.S military was following? Sam Russell At last, common ground where we can agree. I believe the European Americans that faced off against the indigenous population fought them very differently than they would a European foe. Perhaps it is a facet of human nature that atrocities beget atrocities and barbarism spawns barbarism. That would seem to be the case in Bleeding Kansas in the 1850s. One could make a case that American Marines treated their Japanese foes differently than American Soldiers treated their Italian and German foes, precisely because of the manner in which those foes fought. I would have to dig up the source again, but I believe Colonel Forsyth believed he was unfairly treated by Major General Miles and his investigation because Wounded Knee was fought no differently than the manner in which Americans faced off against Indians in earlier engagements. Sam Russell At the risk of reopening this discussion, I was able to dig up the quote from Forsyth regarding his opinion on Maj. Gen. Miles’ investigation of Wounded Knee. It is from a letter that he wrote to Secretary of War Daniel Lamont in September 1895. “There has scarcely been an instance in the history of Indian wars in this country, where the Commanding General could not, had he had the inclination, have damaged the reputation of anyone who had been in command in a fight with Indians. Hitherto, Commanding Generals have defended their officers, have protected them against calumny and recrimination, and, as a consequence, there has existed on the part of officers perfect confidences that, no matter whether slight mistakes were made or not, no blasting of reputations honestly and previously established, would follow a conscientious and faithful discharge of duty. Unfortunately, Forsyth does not state who he was quoting. Sam Russell On further review, Forsyth was commenting not on the investigation, but on Maj. Gen. Miles annual report for 1890-91 in which he reiterated criticisms of Forsyth and the Seventh Cavalry at Wounded Knee. This despite the fact that his own investigation into the incident resulted in a complete exoneration of Forsyth and laudatory commendation from the Commanding General of the Army and the Secretary of War. 464 Medals of Honor were awarded in WWII. One reason for this obvious distortion is that no other military decoration was authorized during the Indian Wars period, so seemingly less exceptional and notable actions were recognized. Other reasons are a matter of opinion. 31 awarded to 5th and 22nd Infantry Regts for action on 21 Oct 1876 at Cedar Creek, Mont. Ter. 13 awarded to 6th Cav Regt for action on 12 Jul 1870 at Wichita River, Tex. 12 awarded to 5th Inf and 6th Cav Regts for action on 9 Sep 1874 at Upper Wichita River, Tex. 10 awarded to 5th and 9th Cav Regts for action on 29 Sep 1879 at Milk River, Colo.
Martin: They had no other medals to give. That was it or nothing. The medal became something else after the turn of the century. They re-wrote the conditions of award. MaryLou: I can’t do this. I can’t be objective because for me, there are visceral feelings about Wounded Knee that I’m unable to put aside. That’s my personal failure, but the point is, I suspect there are others that feel the same. We should all tread carefully. Billy: MaryLou and Sam, were those MoH counts the original awards or the later revised awards? Chris: enjoyed the discussion and still remain in the same opinion just as Sam Russel who is descendant of a cavalry officer who was at wounded knee,my children and my wife are descendants of wounded knee survivors and sand creek survivors ,so althought i can t be objectiv on these matters having lived with the old people whose parents where cut dawn at wounded knee,those trajic events will always be for the native people ,not a note in history but an historical trauma caused by a conquering people set on taking their land at any cost.As noted by the U.N declaration ,it was a genocide on a scale not seen before,gentlemen officer or not.And it is true that lakota and cheyennes killed enemy warriors as well as women and children,it was the war they waged,but they were not gentleman christian officers. Chris: One last question,why did spotted elk band considered hostile when they were only traveling to pine ridge to act as diplomats between the differents chiefs factions on pine ridge at the time? 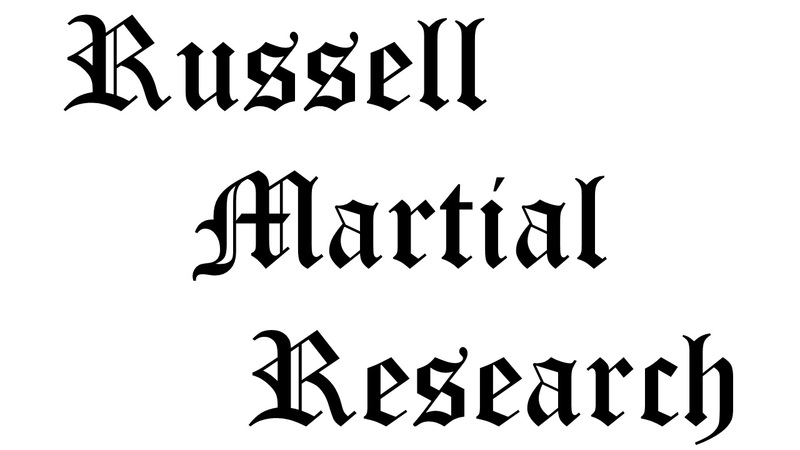 Sam Russell Military intelligence can be summed up as, what you know, what you think you know, and what you don’t know. While Spotted Elk and his people knew their intended destination and purpose, the Army had only prior reports and their current understanding of the situation. They had information stating that Big Foot’s band was well armed, had been joined by “hostile” Indians from Sitting Bull and Hump’s bands, had evaded capture by Col. Sumner a week earlier, and ostensibly were headed to the stronghold in the Bad Lands to convince the hostile camp not to break and return to the agency. MaryLou: I’m done being diplomatic. Spotted Elk’s people were running for Pine Ridge and the Stronghold. They were bewildered, terrified, freezing, bedraggled, weak and sick — a people at the end of their wits. Whatever “atrocity committing savages” they had been, the great warrior nation that had terrorized the Plains was gone. That firefight started out of desperation and terror. You will never convince me that a crack Cav unit couldn’t have contained it without the sickening killing of so many Lakota people. I appreciate your passion and your position. I also appreciate your diplomacy, and I don’t entirely disagree with you. The purpose of my blog is not to defend the Army’s actions, but to present the primary source documents relating to their actions, and to present their side of events, which have been effectively absent in recent literature and website postings. That the Army’s position in 1890 is still offensive today, perhaps even more offensive than it was in 1890, is indicative of racial wounds in this country that have yet to heal. My intent is not to be offensive, rather to be informative. That being said, what I know to be fact is that Major Whitside originally was dispatched with the instructions to capture Big Foot’s band, prevent them from linking up with the “hostile” camp in the Stronghold of the Bad Lands, prevent their escape, disarm them, and, if they resisted, destroy them. Once Whitside had captured the Indians he was given further orders. After disarming them, move them to Gordon, Nebraska, take their ponies from them, and turn them over to the Infantry to be sent out of the country for a time, i.e. put on trains to Fort Sill, Oklahoma Territory. The cavalry was convinced that if the Indians saw the overwhelming fire power arrayed against them, they would surrender their weapons rather than be destroyed. By the morning of 29 December 1890, many, most, or all of the men in Spotted Elk’s Band were convinced that if they surrendered their weapons, they would be destroyed anyway. This placed the Lakota men on what Sun Tzu 3,000 years ago termed “desperate ground.” That is ground on which they could only be saved from destruction by fighting without delay. By the time Col. Forsyth determined that he would have to search each individual Indian for weapons to effectively disarm them the stage was set for tragic consequences. I posit that given that situation, created by all the external events over the previous 200+ years of failed Euro-American and Native-American relations, there was not a unit in the Army in December 1890, nor a man in or out of uniform, that could have defused that situation. Without placing blame or casting aspersions, there were Lakota men who were never going to willingly surrender their weapons that morning, for they were convinced that to do so meant their destruction, and more importantly, the destruction of their loved ones. I also would posit, that there were Lakota men that never would have submitted to being taken to Gordon, Nebraska, willingly given up their ponies, and then submitted passively to being shipped by train out of the country. Brig. Gen. Brooke had given orders to Major Whitside that he was never going to be able to carry out save one, if they resist destroy them. By 29 December conditions were such that conflict was inevitable. The Lakota were going to resist. That Major General Miles eventually resolved the outbreak without further bloody engagements, excepting White Clay Creek the following day, I posit was due largely to a hard lesson learned, by both Lakota and soldier alike, at Wounded Knee: that to force the Lakota to relinquish their arms would result in conflict. General Miles came up with the solution that ultimately worked, only after he had seen the result of Wounded Knee, namely, to have the Indian chiefs collect the weapons and surrender them, and to look the other way when they knowingly relinquished only a token few weapons. Unfortunately, for all concerned, that lesson had yet to be learned on 29 December 1890. Ron: MaryLou I am not saying they were “savages” I am simply stating that one has to recognize there were atrocities carried out on both sides by soldier and Indian alike during the Indian Wars. While Wounded Knee was and remains a very tragic event I can’t bring myself to have personal feelings of disgust about it but not also have those same feelings about other things that happened during other conflicts before and after Wounded Knee. I am much more bothered by the fact that, as humans, we can commit such horrific acts against one another than I am to condemn the individual soldier and/or warrior actions. John: Yes, atrocities were committed on both sides, as Ron says. Ron’s last sentence is the important thing here. As historians, what should we consider and/or conclude from that? John: I am not familiar with all the “statistics” of WK, nor much interested in them simply by themselves, but Sam, or maybe Billy, would you kindly post what “hostilities” had been committed by “hostiles” in the Stronghold, whom needed to be separated from Big Foot’s people, in the late Fall of 1890—white casualties, etc.? Maybe a few head of stolen cattle or something that had been going on since 1877 and continued through the Great Depression? That certainly makes a thief, but a “hostile”? Was that label in the military accounts just a standard reporting assumption? If not, we need to know the hostilities committed. I would like to know of them and study them. Seriously. Sam Russell John… My response will not satisfy anyone and likely only inflame this discourse. It goes back to my statement about military intelligence – what you know, what you think you know, and what you don’t know. The label “hostile” seems to have been generic and perhaps even a pejorative to indicate an Indian that was not doing what some government entity, usually the Indian agent at a particular reservation, wanted them to do. Col. Sumner, when initially attempting to bring Spotted Elk and his band back to the Cheyenne River Agency, indicated that they showed signs of aggression, namely brandishing their weapons, tying off their ponies’ tails, and racing their steeds in an apparent preparation for attack. He indicated that to disarm the band (a week prior to Wounded Knee) would result in hostilities, and further that Spotted Elk was the only stabilizing factor. He left them with their promise to return to the agency with him the following day, and they fled before morning, which the Army perceived as further evidence of their hostile nature. Perhaps because he was sick and possibly dying of pneumonia by 29 December, Spotted Elk’s influence over his band was waning, or perhaps he was unable to hold sway over the members of Sitting Bull and Hump’s bands that had joined Big Foot on his flight to Pine Ridge. To Major Whitside and Colonel Forsyth, whether Big Foot’s band was really hostile or not was immaterial in carrying out their orders to disarm them. They understood them to be hostile, and they would likely state that the fact that the Indians resisted confirmed that they were hostile. Martin: Nice comments Sam. I have enjoyed reading them. John: Thanks, Sam. That is what I figured and I don’t think it inflames anyone here. It’s all about considering the important questions, labeling, various meanings, etc. Military intelligence and responses or non responses to it certainly has caused confusion in history, hasn’t it? Wish it had been better in December 1941 as well as 1890. Wish it had been more complete/and or honest about WMDs in Iraq and many other instances in American military history. But I think you have hit on a great topic here that has not yet been considered by historians—a comparison of the various intelligence perceptions at the time and afterwards of Wounded Knee with other intelligence problems or fiascos at the time and afterwards in American history. I think you are best qualified to explore this issue. It would certainly be new, inclusive, and interesting. It’s a relevant publication in the making! This entry was posted in Asides and tagged 7th Cavalry, 7th Cavalry Regiment (United States), Big Foot, Cavalry, Forsyth, Fort Riley, ghost dance, James Forsyth, Lakota, Medal of Honor, Miniconjou, Nelson A. Miles, Oglala Lakota, Pine Ridge, Pine Ridge Agency, Pine Ridge Indian Reservation, Samuel Whitside, Sioux, Spotted Elk, whitside, Wounded Knee, Wounded Knee Creek, Wounded Knee Massacre. Bookmark the permalink. Personally I would like to see Lakota eyewitness accounts/letters/documents on here not because they haven’t been documented already, but because your diligent citations, photographed documents, and background research are so excellent and seemingly comprehensive, and it is difficult to find any one source/database/website that provides all of that. Basically what I’m saying is that you’ve done very well-done and thorough research and provide documentation that is hard to find elsewhere . But I totally understand that all of this excellent work takes motivation, and it is rather unique. I understand why you don’t present Lakota accounts, and that they have been presented elsewhere, I just wish that you would because your articles work very well for my learning style. thank you for doing and presenting all the research you have; I can fairly say I’ve spent a good hour or two more than I intended reading the articles on here.